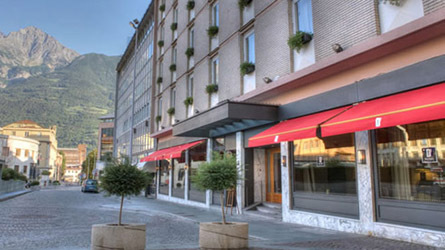 Located in the centre of Aosta and just a short walk from our Aosta office. Step through the front door and you'll be charmed by retro Italian style, reminiscent of the mid 1900s, whilst the bedrooms are elegant and sophisticated. 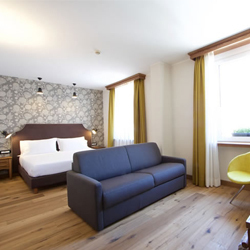 Think traditional French oak flooring, handcrafted Italian oak furniture, bathrooms in which to luxuriate, minibars, tea/coffee machines, safe, free wifi and LED satellite TV. It doesn't get much better! 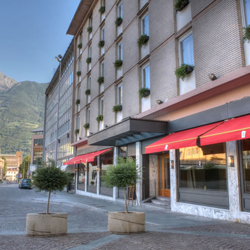 Situated in the centre of Aosta, it gives you easy access to both the town, our Aosta office and the Pila Gondola. 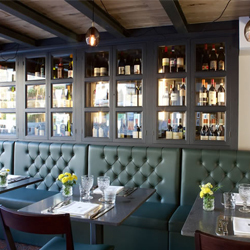 You'll be charmed by retro Italian style, reminiscent of the mid 1900s, whilst the bedrooms are elegant and sophisticated. Think traditional French oak flooring, handcrafted Italian oak furniture, bathrooms in which to luxuriate, minibars, tea/coffee machines, safe, free wifi and LED satellite TV. Everything you need for a relaxing evening after a day on the bike. Below you will find prices from for the Duca d'Aosta for 3 days, 5 days and 7 days. If you require any different length of break then please state in the Enquiry form at the bottom of the page.